Social media advertising is a must in this day and age whether your product is a pair of shoes or a big-ticket item like a house. It’s the ideal medium to reach your target audience while they are relaxed and at their most receptive. The key to a successful campaign is to choose the right objective for your KPIs. 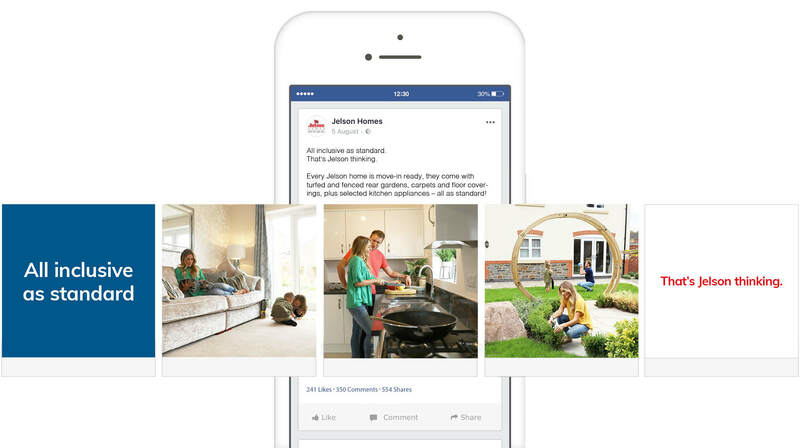 Jelson Homes uses Facebook ads to drive traffic to their website, this makes choosing the traffic objective in Facebook Ad Manager an obvious choice for existing developments. For the creative chose a simple concept and one of Jelson Homes marketing messages to create a short, 12-second video to replace the factual (and static) carousel ads. Video is king on Facebook and can help raise your relevancy score when deployed correctly. The new traffic ads created for the Jelson ad sets gave us an average increase across all ad sets of 450% on the click through rate, an increase of 74% on clicks and lowered the cost per click by 43%. The ad with the most drastic individual change has a click through rate increase of 1607%, increase of 395% on clicks and a lowered cost per click by 63%. And to top it all off with the new Facebook ads, we’ve doubled the number of registrations directly from Facebook traffic.